For those of you with an NBA fan in your family, you are going to want to mark down August 12. That’s the debut date of the brand new NBA Experience at Disney Springs. This all-new destination has been a collaboration in the making with the NBA and it is slated to make Guests feel like what it’s like being a basketball superstar. 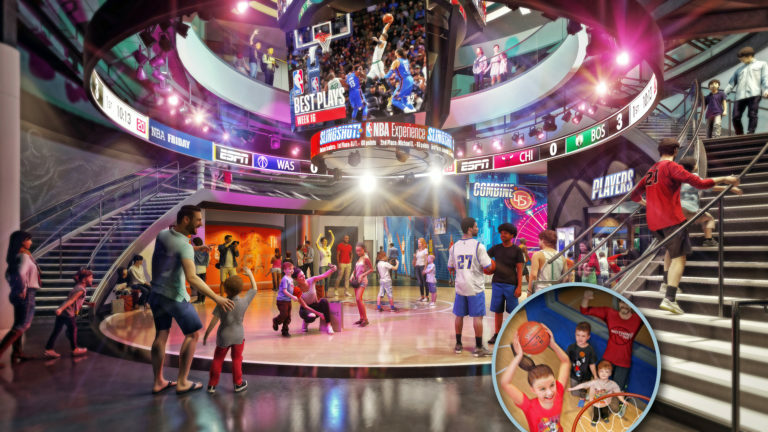 Inside the NBA Experience, Guests will be invited to “Take Your Shot” courtesy of one of 13 interactive elements and hands-on activities across 44,000 square feet and two floors. When entering the NBA Experience, Guests will feel as if they’re walking through the players’ tunnel at an arena. Those who have purchased tickets to the NBA Experience will be able to participate in every activity, with the ability to return to stations to improve performances or learn even more about the game, players and teams they love. Personalization for various activities with guests’ names and associating the activity with their favorite teams. A retail store featuring NBA-themed merchandise. Stay tuned for more details about the NBA Experience here on the blog. Velcro – amazing and futuristic? August 29, 2007 Recent News Comments Off on Velcro – amazing and futuristic? I hope the building can be retro-fitted for something else because I can’t imagine this will be very successful at Disney Springs.